Rotaire register is molded from durable ABS plastic in a variety of colors. The damper mechanism can be easily opened and closed and may be completely removed for full flow. Grill rotates a full 360-degree to direct air flow where desired. 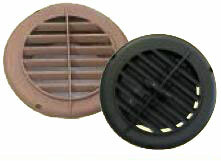 4" diameter mounting collar; overall 5" diameter by 2 1/4" D.